Developed from the US Navy's HRP-2 Rescuer, the Piasecki PD-22 tandem-rotor helicopter prototype (US Air Force designation XH-21) was first flown on 11 April 1952 with Len LaVassar and Marty Johnson at the controls. Winner of a USAF competition for an arctic transport helicopter, the new craft looked almost like the HRP-2, but weighed 6630kg fully loaded, more than twice the earlier machine. A 1425hp Wright R-1820 engine (derated in early models to 1150hp) and a 0.9m increase in rotor diameter to 13.4m gave it much better performance than the HRP-2. The H-21 used the single engine with tandem three-blade rotors. Structurally, it was a new aircraft. The Work Horse could carry fourteen fully equipped troops or an equivalent weight of cargo. Features included a rescue hoist and inflatable donut-shaped floats around its wheels for landings even on marshy tundra. Winterized to support Distant Early Warning (DEW) Line radar stations far to the north, extensive cold-weather testing was performed atop Mount Washington, the highest peak in New Hampshire's White Mountains, as well as in the climate hangar at Eglin Air Force Base. Eighteen Model PD-22 / YH-21 helicopters had been ordered in 1949 for USAF evaluation, these being followed by an initial production batch of 32 H-21A helicopters, named Workhorse in USAF service. For use by the Military Air Transport Service Air Rescue Service, the H-21As were each powered by a derated 932kW Wright R-1820-103 engine; the first flew in October 1953. Six more were built to USAF contract but supplied to Canada under the Military Assistance Program. Vertol produced in 1957 a small number of Vertol Model 42A, exclusively Canadian civil conversion of RCAF H-21B helicopters used to supply stations of the mid-Canada radar chain. The second production variant was the H-21B, which used the full power of the 1063kW R-1820-103 to cover an increase in maximum take-off weight from 5216kg to 6804kg. The Air Force eventually purchased 163, mainly for Troop Carrier Command, and these had autopilots, could carry external auxiliary fuel tanks, and were provided with some protective armour. They could carry 20 troops in the assault role. 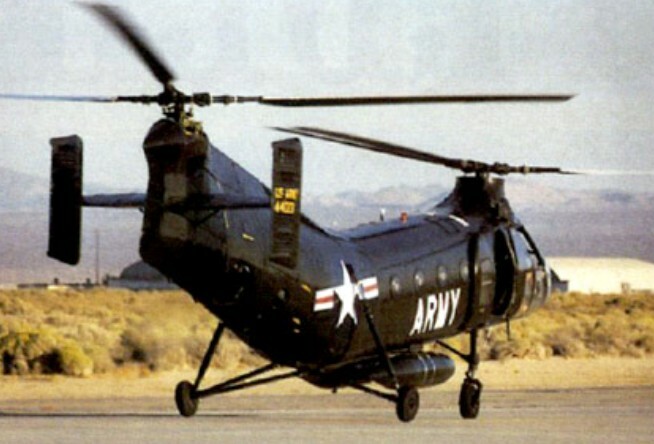 The Army became aware of the H-21's potential as a medium utility helicopter soon after the type's maiden flight, and in 1952 awarded Piasecki a contract for the production of the H-21C variant. This aircraft retained the H-21B's extensive armor plating and ability to carry two external fuel tanks, but had such additional features as increased troop capacity and a 4000-pound capacity belly sling hook. The Army procured 334 H-21C Shawnees, with deliveries beginning in August 1954. In addition, the Army obtained at least sixteen H-21B aircraft from the USAF; the majority of these machines were ultimately brought up to H-21C standard, and all were known as Shawnees despite their origins as Work Horses. The B and C variants of the H-21 were used in Vietnam, equipped with 12.7 or 7.62mm light machine guns which were fired through the cabin doors. While the Navy's helicopters had a 600hp Pratt & Whitney R-1340 engine, those for the Army had a Wright R-1820. Thirty-three of the H-21A were assigned to SAR units in the Arctic and another five were sent to Canada. Foreign operators of the H-21 included the German Army (26), French Army (98), French Navy (10), Japanese armed forces (10) and Swedish Navy (11). The US Army's equivalent was the H-21C Shawnee, of which 334 were built. This total included 98 for the French army, 10 for the French navy and six for Canada; 32 Shawnees were supplied to West Germany, serving with the army's Heeresfliegerbataillon 300. The first deliveries to the Army were in September 1954 with production continuing until March 1959. 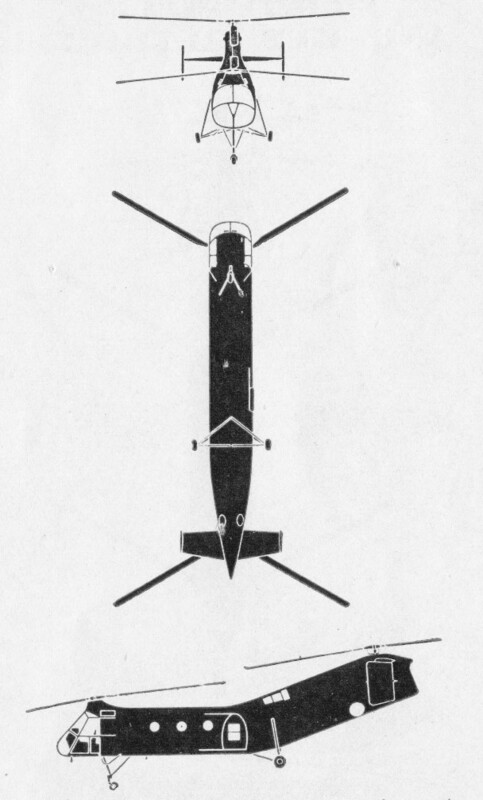 The H-21C, redesignated CH-21C in July 1962, had an underfuselage sling hook for loads of up to 1814kg. Production deliveries were made between September 1954 and March 1959, later helicopters acquiring the company designation Model 43 when the Piasecki Helicopter Corporation became the Vertol Aircraft Corporation in 1956. The H-21 A and H-21B retrospectively became the Model 42. In 1962 the H-21B and H-21C were redesignated as, respectively, the CH-21B and CH-21C. Two turboshaft conversions of H-21C airframes were the Model 71 (H-21D), with two General Electric T58 engines first flown in September 1957, and the Model 105 which had two Avco Lycoming T53s in 1958. The variant was not adopted for production. From the latter was designed the Vertol 107 (Boeing Vertol H-46 series). Most Shawnees were withdrawn from the active inventory by 1965. It was a Shawnee dubbed 'Amblin' Annie that made the first non-stop helicopter flight from one coast of the United States to the other, being refuelled in flight from a U-1A Otter. More significantly, the H-21 was the first American military helicopter type to be deployed in appreciable numbers to South Vietnam: the first four Shawnee units arrived in that country between December 1961 and September 1962. The H-21 also gained the dubious distinction of being the aircraft in which America's first Vietnam casualties were killed; four Army aviators died in July 1962 when their Shawnee was shot down near the Laotian-Vietnamese border. “I was working as a helicopter mechanic with the U.S. Army Aviation Service Test Board in 1954 and 1955 and we received some of the first production H-21Cs for operational testing; I was assigned to serial number 51-15888, tail number 115888, the eighth built, and I recall us having 115881 also which I believe was the one we picked up at Edwards AFB in 1955. The Air Force did all engineering flight testing for the Army and when they completed tests on the H-21C version (in preparation for their USAF H-21B version ordered after the "C"), a small group of us from the Fort Rucker Test Board went to Edwards to take over the ship and perform some high altitude and desert tests before flying back to Rucker. Arriving at Edwards, complete with papers and "secret" clearances, we promptly discovered that the USAF's Army H-21C was in terrible condition and unairworthy. Much to their dislike and consternation, we hung around the air base for several days while we performed an inspection and changed the Wright 1820 engine - the desert flying had eaten up the cylinders and bearings to the point that the 19-gallon oil tank wouldn't sustain a single flight! Needless to say, there was some exciting experimental jet activity going on at Edwards at that time and we GIs were in no hurry to leave as we had a front line seat on the test ramp. We spent a few weeks at an Apple Valley dude ranch, parking the helicopter in the desert, and refueling at George AFB. Each day we flew several sorties into the White Bear region and did a few exciting running takeoffs at White Bear Lake. We made an uneventful (mostly), but rather warm and humid, flight back to Rucker, taking a pretty straight course from San Antonio across Texas, Louisiana, Mississippi and into Alabama. A late evening thunderstorm threw us off course during a night flight leg and we made an "off-airport" landing in a drenched high school football stadium in Mississippi (still lit up following a game); the locals fed us and I wound up spending the night RON in a friendly funeral parlor. One of the Board's test H-21s made the first non-stop flight across the U.S. in August, 1956; it took 37 hours and refueling by a fixed wing”. 1955 commercial developments of the H-21 included models 42, 43, 44, 63, and 71.